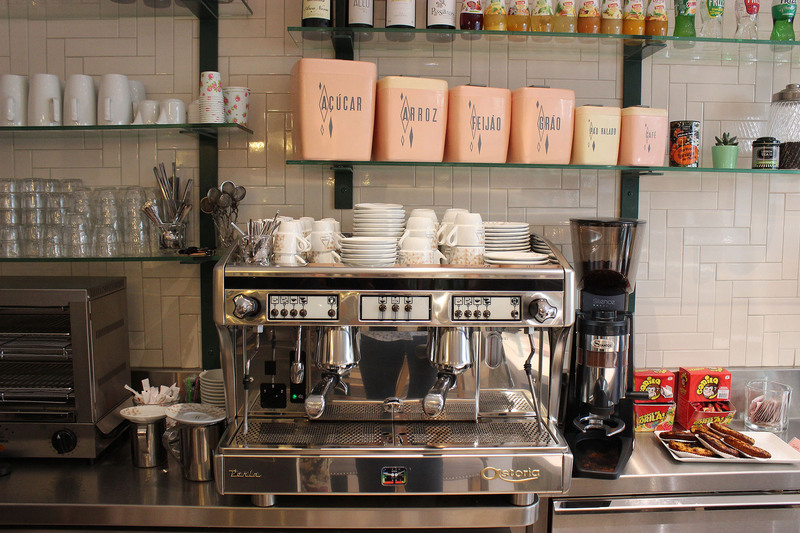 Among all of the trendy coffee shops and boutiques along the Canal Saint Martin, one new address is standing out from the rest. 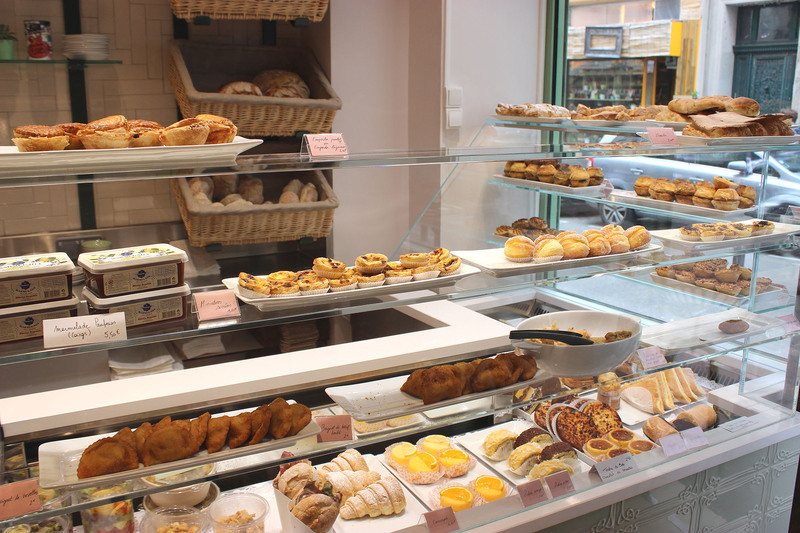 Forget croissants and café crèmes for a moment and immerse yourself in the pasteis de nata and galão at DonAntónia, a part eatery, part grocery store that is dedicated to the tastes of Portugal. The idea is simple: everything – down to the milk in the coffee – comes from Portugal. A team at Canelas bakery in Pierrefitte, just north of Paris, creates the pastries each day. In fact, they’ve been catering Portuguese cuisine for 35 years, but DonAntónia is the first storefront for the products in Paris.Virginie Gonçalves, one of the store’s owners, married into the Portuguese family behind the Canelas brand. “Our base is to sell products that are fresh, artisanal, hand-made, and Portuguese,” she told me as I visited the shop one Sunday afternoon. 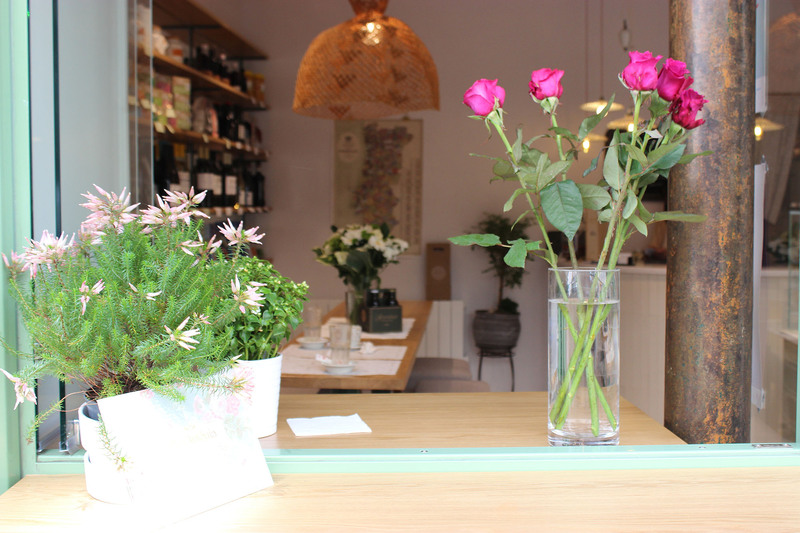 A longtime resident of the Canal Saint Martin district, the effervescent Virginie worked at a hospital before making the leap to opening DonAntónia, something she has wanted to do for quite some time. When the owners of the little grocery store at 8 rue de la Grange aux Belles decided to sell their space, Virginie made her move. She wants to make Portuguese specialties known to the French. Her eye-catching window is doing a pretty good job, with passers-by popping their heads in as we chatted. The shop is tiny but functional, fitted with one large table surrounded by stools and a case overflowing with both sweet and savory items. Breakfast is an easy sell: coffee and carbs. Go simple with some torrada, toasted bread baked by Canelas and served with butter and jam. 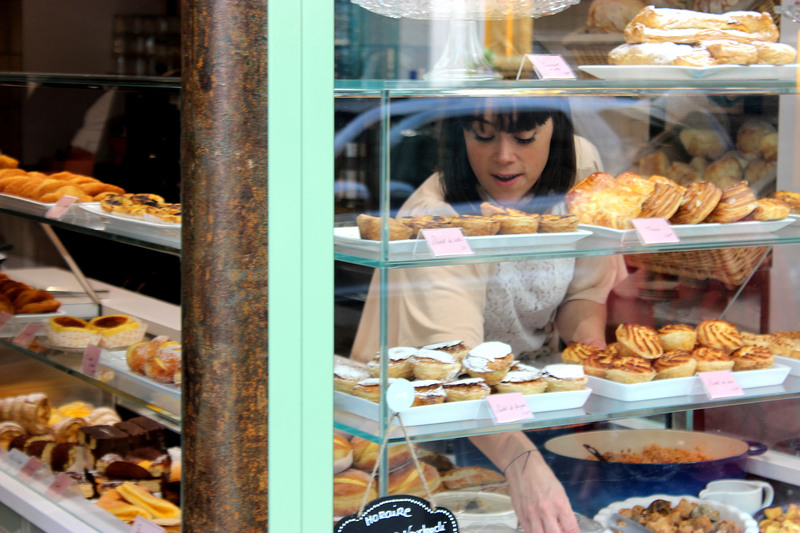 Or go sweeter and sample a few of the pastries calling you from behind the glass. 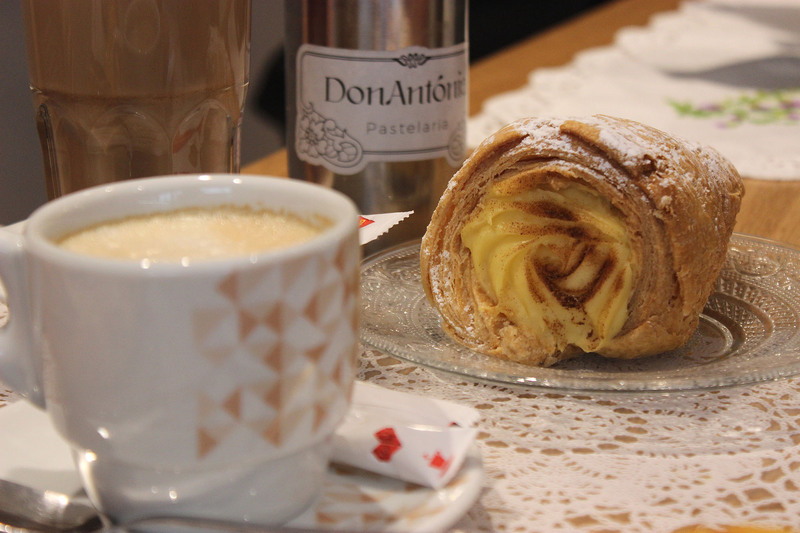 The diet-killing bola de Berlim is the love child between a French beignet and a Boston cream donut, a croissant-like pastry filled with creamy custard. Both pair excellently with any of the coffee options, like a milky galão, or a simple black espresso. At lunch, sandwiches and empanadas, like little pot pies, are just a few of the dishes on offer. Grab one of the stools to eat in or take your treats to go for a picnic along the Canal Saint Martin, if the weather is cooperating. 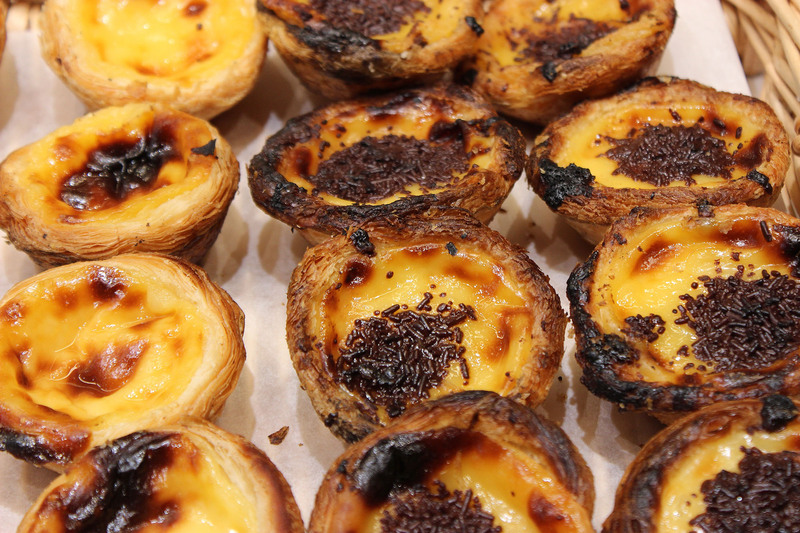 The star is, of course, the pastel de nata, Portugal’s culinary pride and joy. Sweet, eggy filling encased by a crispy, flaky nest is as simple as it is satisfying. At DonAntónia, you can get the original version, as well as ones with chocolate or coconut. They even make miniature versions so you can easily sample all of them in one sitting. The shop also sells products from small companies in Portugal. Of course, no one is complaining about French wine, but sometimes it’s fun to change it up a bit. Wine, beer, granola, tea, and other food items line the shelves along the wall. “A lot of these items are in Paris for the first time. 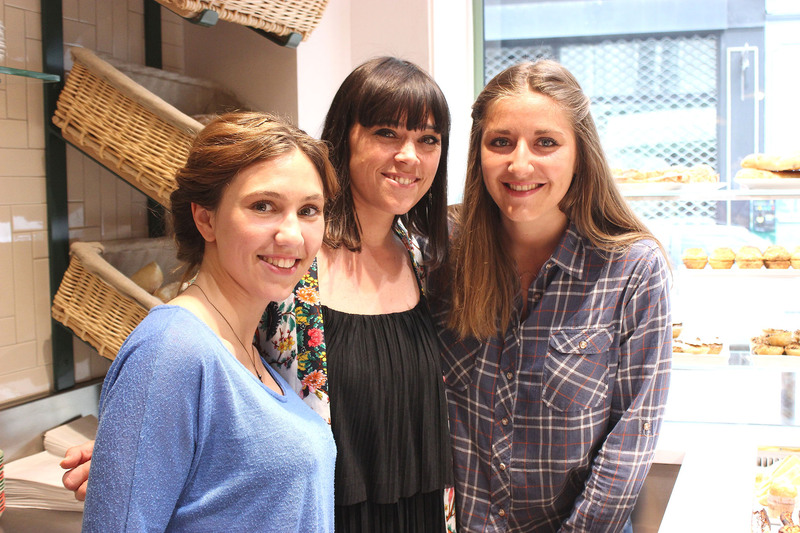 We’re proud to bring them here, and [Parisians are] happy as well,” Virginie said. 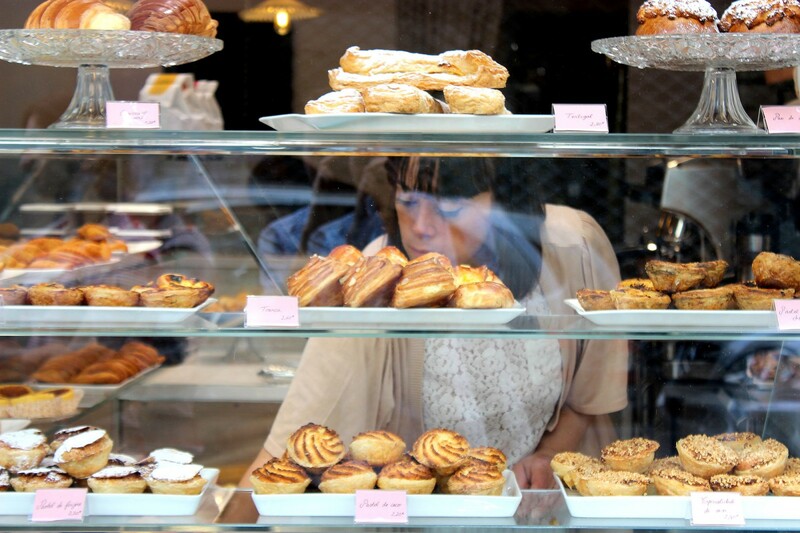 Stop in to DonAntónia to pick up a pastel or two and give Virginie an olá – but stick to French after that. She admits her Portuguese still needs some work, but her smile makes up for it. DonAntónia Pastelaria – 8 rue de la Grange aux Belles, 75010. Métro: Jacques Bonsergent; Tel: +33 (0)1 42 45 72 06. Summer is here, so where better to spend your relaxing weekend than beside the Canal St-Martin? Here is Sylvia Sabes’ guide to the quartier. If you can resist devouring your DonAntónia treats for a short time, why not head to Fraîche for lunch or dinner first? Read Isabel Miller-Bottome’s review here. Why Canal St-Martin is one of the coolest areas in Paris at the moment. Read this interview with Sébastien Kopp, owner of Centre Commercial, on Condé Nast Traveller. Written by Bryan Pirolli for the HiP Paris Blog. All photos by Bryan Pirolli. Looking for a fabulous vacation rental in Paris, London, Provence, or Tuscany? Check out Haven in Paris.